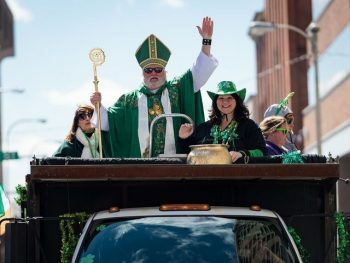 Even though next Saturday (March 17) is officially St. Patrick’s Day, this weekend is St. Patty’s Day Weekend for many area residents — a weekend when everyone’s homeland is Ireland and green is the preferred color for everything (clothes, food, hair, milkshakes, decorations and even beer and wine). Dating back to 1771, the Philadelphia St. Patrick’s Day Parade (www.philadelphiastpatsparade.com) is one of the city’s longest-running traditional events. It is also one of the oldest parades of any kind in the nation. It will be held on March 11 from 11:15 a.m.-3 p.m.
A procession of drummers, dancers, various performers and Irish bands will move down JFK Boulevard alongside floats decorated in honor of St. Patrick, Ireland’s patron saint. The parade will originate at 16th Street and JFK Boulevard. The highly-entertaining annual event is free for spectators. The Grand Marshall for the 2018 parade is Sister Mary Scullion, RSM. A Philadelphia-based religious sister and activist, Scullion was named among Time Magazine’s 100 Most Influential People in The World in 2009. Prior to the parade, Saint Patrick’s Church (20th and Locust streets) will celebrate with a “Commemorative Parade Mass.” The Mass will begin at 9:15 a.m. The Parade takes place every year — rain or shine. Unless there is a blizzard, it does not get cancelled. As usual, the Philadelphia St. Patrick’s Day Parade will air LIVE on Fox 29. The Annual Saint Patrick’s Parade in Conshohocken (https://www.facebook.com/events/782515871943958/) is scheduled for March 10 with a 2 p.m. start at 11th Avenue and Fayette streets. The parade moves along Fayette Street from 11th Avenue to Elm Street and will end in front of the Washington Fire Company. During and after the parade, pubs and restaurants along the route will be hosting parties. Shuttles will be leaving from the parade site to AOH Hall. The last bus will be leaving at 5 p.m.
Entertainment at the AOH Hall will be provided beginning at 5 p.m. and food will be available. The parade awards will be given out at that time during the dinner hours. The Irish Culture Club of Delaware (302-454-7474, www.irishde.org) will stage its 43rd Annual St. Patrick’s Day Parade on March 10 at noon on King Street in downtown Wilmington. The Parade starts at noon at Fourth and King streets. It will move up King Street and pause briefly at the Grandstand located at Rodney Square. The Parade will continue on King Street and will conclude near 14th Street where the Post-Parade Hooley is located. As always, the post-Parade Hooley (festive party) will be held in a parking lot at 14th & King streets inside a large tent. Commemorative mugs will be sold for $20 each and “unlimited beer mug refills” will be available throughout the afternoon until 6 p.m. All beer and celebrating must stay within the enclosed area of the parking lot. Later that day, the Shamrock Shuttle/St. Paddy’s Loop (302-655-6483) will keep the festivities going. The complimentary Loop shuttle ser­vice begins at 7 p.m. and runs until 1 a.m. with buses stopping at 12 bars in the city throughout the night. There is a $10 cover for a wristband which gives patrons access to all the clubs, including Catherine Rooney’s, Kelly’s Logan House, Timothy’s Riverfront Grill, Dead Presidents Pub & Restaurant, Chelsea Tavern, Ernest & Scott Taproom, Club Lavish, The Queen, Grotto’s Pizza Pennsylvania Avenue and Trolley Square Oyster House. Another post-parade party will he presented by the New Castle County Irish Society (1301 South Rodney Street, Wilmington, 302-658-8288, http://www.nccirishsociety.org) from 1-6 p.m.
Everyone is welcome to continue the festivities at the society’s hall. Live music by John Kelly will be featured. Admission is $10 for adults and free for children (12 and under). Cash bar and food will be available. Additionally, the Society will hold its “St. Patrick’s Day Ham & Cabbage Meal” on March 17 from 11 a.m.-7 p.m. The adult platter is $9 and includes coffee or tea and dessert. The platter for children (ages 8 and under) is $4 and includes dessert but not coffee or tea. 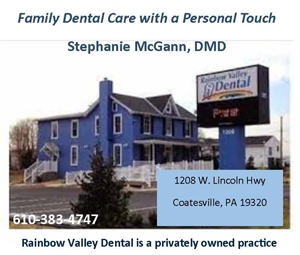 On March 10, there will also be a holiday parade in Delaware County. The Springfield St. Patrick’s Day Parade will get underway at Springfield Road and Saxer Avenue. The popular annual event, which is hosted by King of Prussia’s Brian Boru Pipes and Drums, will start at noon. This weekend, the Greater Philadelphia Expo Center (100 Station Avenue, Oaks, 484-754-EXPO, http://www.phillyexpocenter.com) will host two popular annual events – the Greater Philadelphia Boat Show and the International Gem & Jewelry Show. The Greater Philadelphia Boat Show (http://www.phillyboatshow.com) opens March 9 and runs through March 11 at the huge expo hall in Montgomery County. The boat show allows visitors to shop and compare without having to travel all around the area to visit a variety of different dealers. It provides an excellent learning experience for those who are not already boating families but would like to know more about boating and related activities. Special show prices from most of the dealers also make this event a good shopping opportunity for those people who already own boats and are ready to trade in and move up. Types of boats offered at the show will include ski boats, saltwater boats, pontoons, bass boats, motor yachts, jet boats, PWCs, runabouts and deck boats. Other displays will present information on marinas, parts, accessories and boating safety. The show will offer a wide array of products for boating enthusiasts including boating supplies, books, clothing, marine financial and insurance services, electronic navigational devices and engines. Show hours are March 9 from 1-8 p.m., March 10 from 10 a.m.-7 p.m. and March 11 from 11 a.m.-5 p.m. Admission is $10 for adults and free for children (16 and under). There will be a special $5 admission fee on March 9 after 5 p.m.
Attendees will be able to find a wide array of jewelry selections priced very affordably at this weekend’s “International Gem & Jewelry Show” at the Greater Philadelphia Expo Center (100 Station Avenue, Oaks, 484-754-EXPO, www.intergem.com). The show, which is a sales and exhibition event that features gems, jewelry, fossils and stones of all sorts, is running from July 7-9 and is billed as the “world’s largest jewelry bazaar”. Admission to the public show is $8 for adults while children (ages 9-16) are free with a paid adult ticket. The show’s policy states that children ages eight and under are not permitted to attend the show. The “International Gem & Jewelry Show” features an amazing exhibition of gems, minerals and jewelry. Dealers will be displaying and selling every type of gemstone, as well as one-of-a-kind jewelry creations, estate jewelry, special celebrity exhibits and accessories. 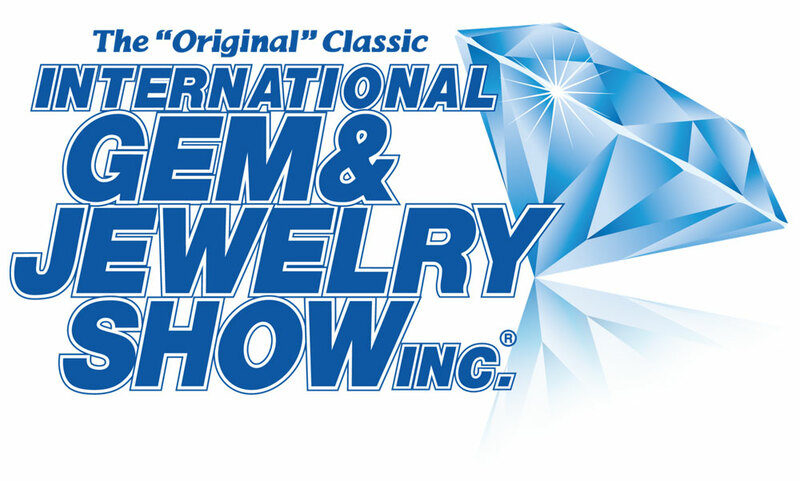 The show will have more than 150 dealer booths where show attendees can select items from a wide range of categories, including beads, rings, settings, watches, necklaces, diamonds, opals, earrings, silver, gold, crystals and pearls. The hours for the show are noon- 6p.m. on March 9, 10 a.m.-6 p.m. on March 10 and 11 a.m.-5 p.m. on March 11. Charter Day, which is celebrated on March 11, recognizes the day William Penn received his land grant for Pennsylvania from King Charles II of England in 1681. In observance of Pennsylvania’s founding, some of the region’s historic sites host special activities — all of which are free and open to the public. 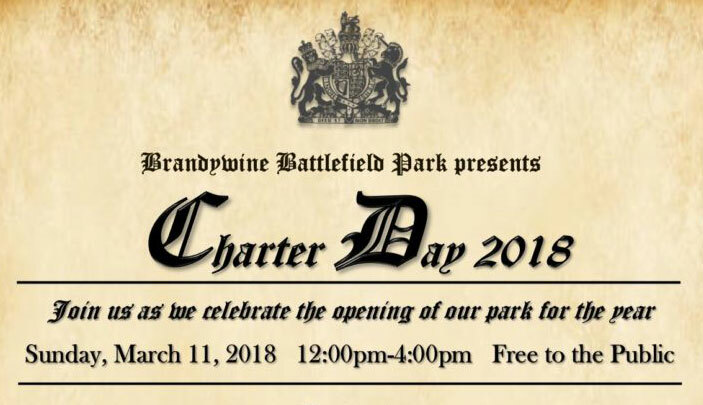 Brandywine Battlefield Park, Chadds Ford (Route 1, Chadds Ford, http://brandywinebattlefield.org, 610-459-3342) will celebrate Charter Day with the re-opening of the houses and museum and a variety of history-themed activities. 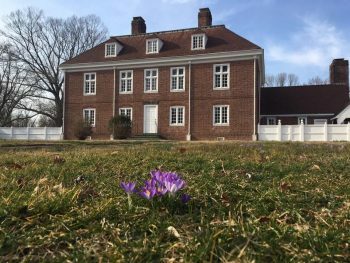 The event will feature Continental soldiers, period interpreters, historical demonstrations, tours of the Benjamin Ring House and the Gideon Gilpin House and a talk by William Penn (portrayed by John Gras). Visitors will also be able to learn about Joseph Townsend, a young Quaker boy who wrote about his experience during the Battle of the Brandywine. In Lower Bucks County, Pennsbury Manor (400 Pennsbury Memorial Road, Morrisville, 215-946-0400, www.pennsburymanor.org) is celebrating Charter Day on May 11 with gusto. A rare and special exhibit will be installed for Charter Day. “The Great Law” drafted by William Penn in 1682 will be on public display for the first time ever. This six-page edict was the first governing document for the Province of Pennsylvania and mandated, for the first time in Pennsylvania history, the freedom of religion and religious practices. On short loan for Charter Day from the State Archives, “The Great Law” will give visitors an opportunity to get a look at this revolutionary directive that helped lay the ground work for the Constitution of the United States. The free program at Pennsbury Manor includes tours of the Manor House, exhibits, Living Theater presentations, blacksmithing, beer brewing, joynery, hearth cooking, and more. During “Charter Day” the historic site will be holding a food drive so visitors are requested to bring along a non-perishable food item. The Daniel Boone Homestead (400 Daniel Boone Road, Birdsboro, 610-582-4900, www.danielboonehomestead.org) will offer an exciting open house and living history event featuring a variety of 18th-century demonstrations and hands-on activities on March 11 from noon-4 p.m. The site will be open free in celebration of King Charles II granting the land which would become Pennsylvania to William Penn. Many 18th-century demonstrations will be occurring throughout the afternoon and period music will be performed in the parlor at the Boone House. Smells of meat and vegetables cooking over an open hearth will greet the visitor at the Boone House and the Bertolet Log House. Bread will be baking in the Bertolet bake oven and meat will be smoking in the Boone smoke house. The Visitor Center Gift Shop will feature many new items representing the life and times at the Boone Homestead. On March 11 from noon-4 p.m., the Conrad Weiser Homestead (28 Weiser Lane, Womelsdorf, 610-589-2934, www.conradweiserhomestead.org) will host military units, both French and Pennsylvania Provincial, who will be demonstrating 18th-century drill. There will be a Native American on site to answer visitor questions. There will also be an exhibit displaying 18th century reproduction folk art. John Moore, author of the Frontier Pennsylvania Series, will be on site from 1 to 3 p.m. signing his books. There will be an 18th century divine church service for all to attend starting at noon. Weather permitting, there will be an opposing force tactical between the French and Pennsylvania soldiers. 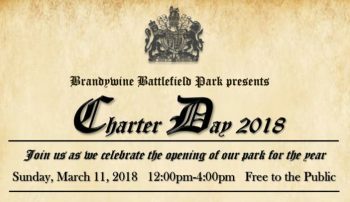 Other area sites that will have Charter Day celebrations this weekend are Landis Valley Museum (2451 Kissel Hill Road, Lancaster, 717-569-0401, www.landisvalleymuseum.org), Railroad Museum of Pennsylvania (300 Gap Road, Ronks, 717-687-8628, www.rrmuseumpa.org), Cornwall Iron Furnace (Rexmont at Boyd Street, Cornwall, 717-272-9711, www.cornwallironfurnace.org) and Ephrata Cloister (632 West Main Street, Ephrata, 717-733-6600, www.ephratacloister.org). 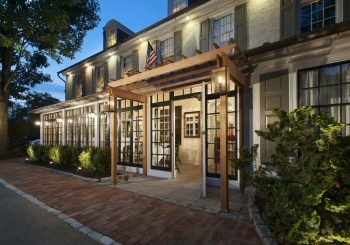 The list also includes several sites in Montgomery and Bucks counties — Graeme Park (859 County Line Road, Horsham, 215-343-0965,www.graemepark.org), and Hope Lodge (553 South Bethlehem Pike, Fort Washington, 215-343-0965, http://www.ushistory.org/hope/). 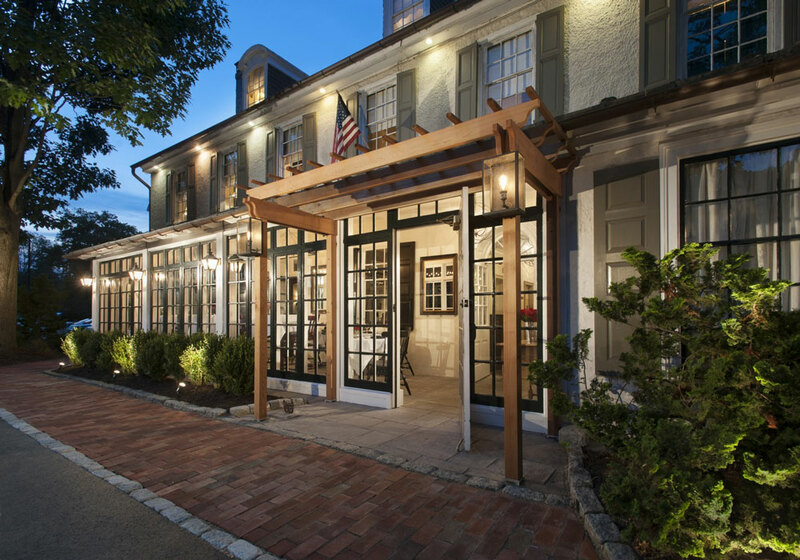 The Chaddsford Winery (632 Baltimore Pike, Chadds Ford, 610-388-6221, www.chaddsford.com) will present an event called “Pop Up Food Truck Weekend” on March 10 and 11 from 11 a.m.-6 p.m. each day. Visitors are invited to “grab some grub, your drink of choice, and cozy up by a fire pit to enjoy live music with friends.” Admission is free, and all wine and food purchases are pay as you go. The food truck line-up features Phyllodelphia, Mama Mia, Nick’s Roast Beef, Deer Head Hot Dogs, and Lulu On The Go. Live music will be performed on March 10 by Sam Capolongo and March 11 by The Road Tapes. The music will be presented from 12:30-4:30 p.m. both days. This is the last of two weekends the Chaddsford Winery is presenting its exclusive “Reserve Tasting + Tour” program at half-price. During the program, visitors will gain comprehensive knowledge about Chaddsford’s wine-making philosophy, production facility and growers. The tour will conclude with an artisanal wine and food pairing featuring small bites and three small-batch Artisan Series wines. The special Reserve Tours, which include a traditional wine tasting, are held on Saturday and Sunday at 11:30 a.m. and 1:30 and 3:30 p.m. They are limited in size and last about 45 minutes. So, tour participants must be at the winery at least 15 minutes prior to the start of the tour. Dry White Wine Flight with 2015 Proprietors Reserve White, 2016 Sauvignon Blanc, and 2014 Barrel Select Chardonnay; and Sweet Wine Flight with Sunset Blush, Sangri-la Sangria, and Niagara. Tickets for Reserve Tours are $20 (when booked in advance online) and $25 (onsite while supplies last). To take advantage of the special offer, use code “MARCHTOUR” when you reserve your spot online and save 50 per cent off for each ticket. If you want to visit this year’s Philadelphia Flower Show at the Pennsylvania Convention Center (12th and Arch streets, Philadelphia, 215-988-8899, www.theflowershow.com), this weekend will be your last chance. The festive event, which opened on March 3, will close on March 11. The huge annual show has “Wonders of Water” as its theme for 2018. The show, which is presented every year by the Pennsylvania Horticultural Society, celebrates its 189th anniversary in 2018 by treating visitors to a spectacle of floral displays in every size, style and shape imaginable. The show will feature 10 acres of exhibition halls with floral displays and vendors. Floral competition is always a major drawing card at the annual show. The 2018 Flower Show will feature a large number of garden displays and thousands of plants and floral designs entered in various competitions. These entries will be reviewed and rated by a staff featuring over 200 expert judges from across the nation. The show’s biggest attraction each year is the massive “Marketplace” featuring over 150 vendors from all over America and several European nations. They will be selling flowers, orchids, floral-inspired furniture, sheds, artwork and unique garden-related crafts and supplies. As an added attraction, a large variety of gardening experts will provide learning opportunities in the Lecture Series. Be prepared for large crowds during the weekend hours. If you want a more leisurely visit, plan to visit the show during the week. Also, take public transportation if possible. Vehicular traffic in the area is frequently a nightmare and parking lots tend to fill up early even though they are charging exorbitant fees. Tickets for the Philadelphia Flower Show are available online in advance for $32 and at the door for $40. Tickets are $20 in advance and $24 at the door for students with valid ID and $17 ($19 at the door) for children ages 2-16. Blue is one of the rarest colors in the plant world and Longwood Gardens honors blue flowers with a special celebration. 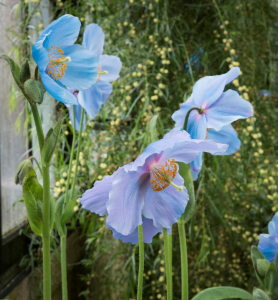 The site’s horticulturists have researched, acquired, and grown hundreds of blue-hued blossoms and foliage to adorn the Orangery and Exhibition Hall. Free concerts will be performed by the Bob Beach Duo on March 10 (2-5 p.m.) and Stevie & the Bluescasters on March 17 and 24 (2-5 p.m., both days). The schedule of ticketed live entertainment features Ruthie Foster on March 16 and Rory Block on March 29. If you’re looking for a brief break from winter, remember that it is always spring in Longwood’s conservatory. Every year in February and March, Longwood celebrates the one of the world’s most popular plants – the orchid. The festive celebration of the ultra-popular plant is called “Orchid Extravaganza” — an annual event that is running now through March 25. On March 12, paranormal investigators Kelly Schmitt and Aubrey Baldwin will discuss results of paranormal investigations of the Paoli Battlefield that took place in May and October 2017. These tours showed that there was a tremendous amount of paranormal activity all around the battlefield. The next two installments of the lecture series will be “Fort Mifflin: The Fort That Saved America” by Elizabeth Beatty on April 10 and “Soldiers Stories: Letters from the Valley Forge Encampment” by Dr. Nancy K. Loane on May 8. Winterthur Museum, Garden & Library (Route 52, Wilmington, Delaware, 800-448-3883, www.winterthur.org) just opened its 2018 season last weekend. This weekend, Winterthur is kicking into gear with a special event called “Back to Bend,” which will be held on March 10 from 10 a.m.-3:30 p.m. Visitors are invited to celebrate the early bulb display of the March Bank with a lecture, garden tour, and special sale of rare and unusual plants. Snowdrops and other choice, early bulbs bring much more to the garden than beauty. They are the objects of passion and desire that have led plant explorers to remote regions of the world. They are controversial as their provocative taxonomy and obsessive horticultural interest sometimes bring out the best or worst of the people intimately associated with them. Many are rare in the wild and serve as flagship species for conservation efforts. 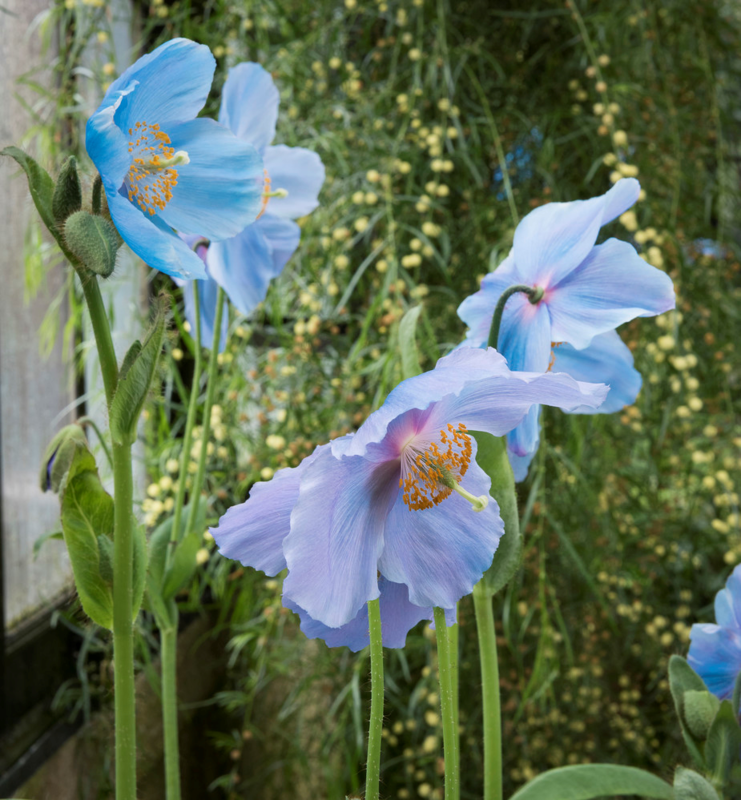 Lastly, they are exotic, providing a sense of place in the garden at a time of the year that few other plants can rival. 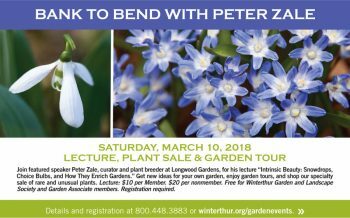 In this presentation, Dr. Zale will touch on these topics while highlighting some of the more interesting stories related to these plants. 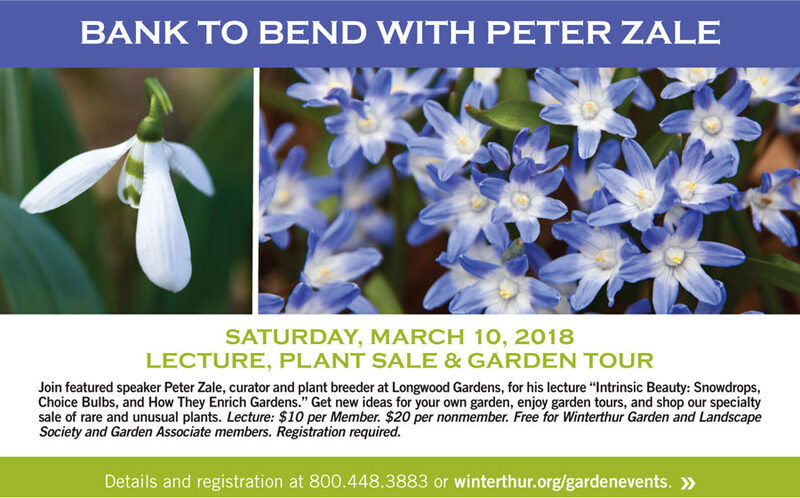 In closing, he will discuss their role in garden amplification efforts at Longwood Gardens and the development of his personal garden. The “Garden Tour,” which is scheduled for 1 p.m., will begin at the Visitor Center Patio while self-guided tours run all day. The “Plant Sale” will be held from 10 a.m.-3 p.m. in the Visitor Center. Admission is $20 for adults, $18 for seniors (age 62 and older) and students, and $6 for children (ages 2-11). Another event with an outdoor vibe will be “From Sap to Syrup” which will be presented on March 10 at Bellevue State Park (800 Carr Road, Wilmington, Delaware, 302-761-6963,http://www.destateparks.com). Visitors to the park will be able to learn when sap flows, find out what trees are used for making maple syrup, and observe the process of making syrup. Additionally, participants will have the opportunity to tap a tree and enjoy a special syrup-tasting with pancakes. The program will be presented from 10 a.m.-noon and again from 1-3 p.m.
Tickets for the event are $8 for adults and $5 for children (under 12). 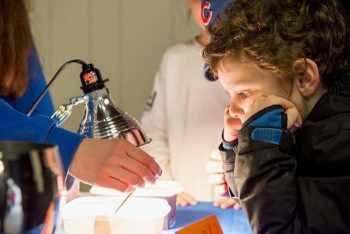 The Garden State Discovery Museum: (2040 Springdale Road, Cherry Hill, New Jersey, 856-424-1233, www.discoverymuseum.com) is presenting a special program called “Passport to Discovery” on selected weekends now through the end of March. Participants can join with the museum’s friends from Paws Discovery Farm as they present a program about discovering animals that are native to the Americas. Guest can then head over to the museum’s Milly’s Which Craft Art Studio crafted by A.C. Moore for some wild animal art. The next program in the series “Passport to Discovery: Polynesia” will be presented on March 17.